'Castlevania' Season 2 Poster: Blood Will Seek Blood! « Rumor: Netflix is turning Blizzard’s ‘Diablo’ into a TV show. Not even the Devil can escape adaptation! ‘Castlevania’ Season 2 Poster: Blood Will Seek Blood! The first poster for Season 2 of Netflix’s Castlevania animated series promises bloody things are in store for Trevor Belmont, Alucard, and Sypha Belnades. 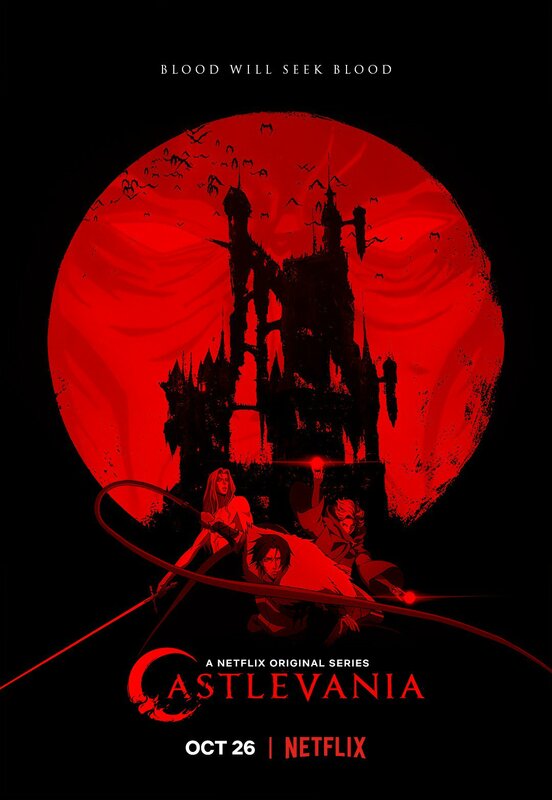 The Netflix tweeted the official poster yesterday with the series’ three heroes set to the backdrop of Dracula’s Castle under the vampire lord’s gaze with a striking blood moon. While confirming the October release date, the poster features the ominous tagline “Blood will seek blood”. The acclaimed video game adaptation is confirmed to have an eight-episode second season, twice as many as last year’s first season. The upcoming season looks to pick up the action right where last July’s first season finale left off with vampire hunter Trevor Belmont teaming up with Dracula’s dhampir son Alucard and warrior priest Sypha to venture into Dracula’s Castle and stop the vampire’s bloody war against humanity. An adaptation of the classic 1989 NES title Castlevania III: Dracula’s Curse, the television series had originally been in development since 2007 as a standalone animated film. In 2015, producer Adi Shankar became attached with the project reimagined as an animated series optioned by Netflix. Castlevania Season 2 will debut on Netflix on October 26 and stars Richard Armitage as Trevor Belmont, Alejandra Reynoso as Sypha Belnades, James Callis as Alucard, and Graham McTavish as Dracula. Adi Shankar returns as showrunner with the adaptation written by Warren Ellis.